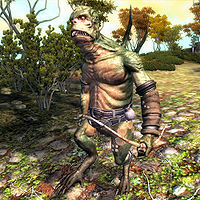 Grummites are frog-like, tool-making creatures with a primitive culture, very much similar to the Goblins of Cyrodiil. They can often be found protecting the egg sacs that house their young, even though the book From Frog to Man states that they tend to ignore their eggs once laid. They are usually around caves and ruins that contain Madness Ore. So if you see some Grummites, you may also find some Madness Ore in the area or on their bodies. There are also Grummite Archers. It is advised not to fight these while they are swimming or it's raining, since all forms get a 1 to 3 point regeneration from water. Grummite Heal - GP - Restore Health 25 pts on Self, Restore Fatigue 50 pts on Self. Absorb Strength - 10 - Absorb Strength 10 pts for 20 secs on Touch. * There is a small chance the Grummite carries a Madness Matrix instead. 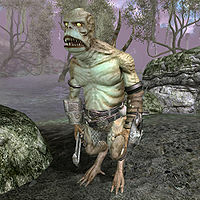 These Grummites have the same names of the standard forms, but are equipped with bow and arrows. Grummite Shamans can be found in Xedilian during A Better Mousetrap. 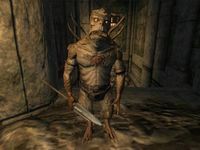 ** Instead of the usual minimum Creature Level 20 for the Grummite Deathdealer family. Likely an error in consistency. Note that normally the Grummite Shaman Deathdealer still only appears from level 23 onward, so they will always have a level of at least 21. This Grummite can be found in Aichan. Grummite archers will almost never use melee weapons in close range, and use hand-to-hand combat instead. ? This page was last modified on 25 December 2018, at 17:25.